Help make a difference in our community; become a Stardust volunteer and better the environment! By volunteering at Stardust, you can get valuable experience in preventing waste and promoting reuse and repurposing. If you’d like to volunteer, email us at volunteer@stardustbuilding.org. Stardust Building Supplies provides an educational, fun, and hands-on experience for volunteers. 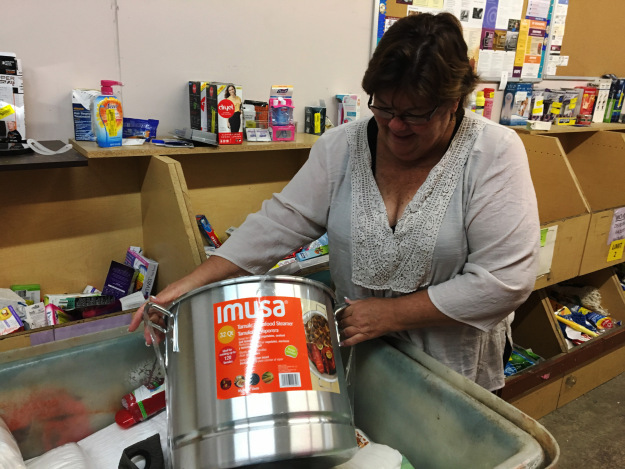 We have individual and group volunteer opportunities in various areas of the organization, such as our reuse center, administrative office, and Gifts In Kind program. While volunteering, you can expect to be in a warehouse environment, which is why it’s important to wear closed-toe shoes and clothing you don’t mind getting a little dirty. Volunteers must be at least 18 years of age, unless accompanied by a parent or guardian. We’re a great place for large volunteer groups! At Stardust, we accept a variety of donated items, including cabinetry, appliances, doors, windows, hardware, flooring, plumbing, furniture, and more. With donations arriving daily, we need reuse center organizers to help us keep our warehouse organized. Responsibilities include moving and sorting inventory, keeping aisles and shelves straightened, and creating product displays. We’re looking for volunteers who have skills in carpentry, welding, woodworking, or construction, and who also enjoy creating, crafting, and building! As a reuse organization, we have a variety of salvaged and reclaimed building materials that volunteers can use to create displays and projects that will inspire the community to reuse and repurpose. As a donation assistant, you’ll help donors with incoming donations, write donation receipts, and provide customer service. Other duties may include organizing and cleaning the back room. This volunteer position requires a lot of heavy lifting. We ask that volunteers must be able to lift at least 65 pounds, as you will be unloading heavy appliances, cabinet sets, and other building materials. You can help non-profit organizations receive household items, toiletries, office supplies, toys, and other items to help improve the well-being of their clients. In this role, you’ll partner with organizations who are a part of our Gifts In Kind program and help sort through thousands of donated items. Please submit your application via email to volunteer@stardustbuilding.org. Our board members serve on key committees and task forces. They are essential to the Stardust team.